Capture the sun and relax while sitting in the shade of your Big Kahuna Solar Pergola Kit. 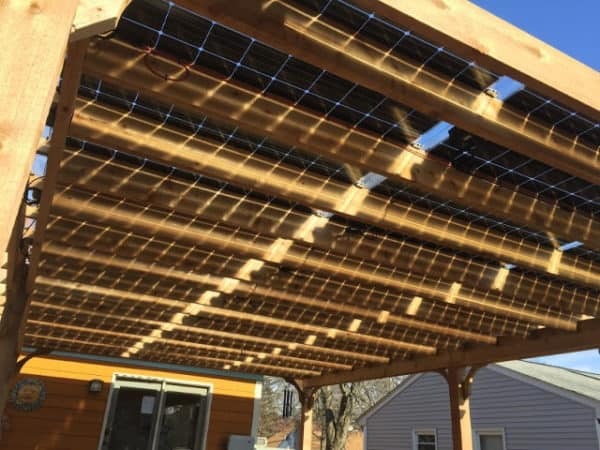 While offering many of the same design features as our standard Big Kahuna pergola, The Big Kahuna Solar Ready Pergola Kit is configured to accommodate solar panels. 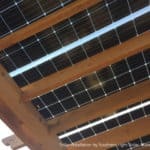 This kit includes all materials required to assemble your solar pergola, but does not include solar panels, racks, or other solar related equipment. 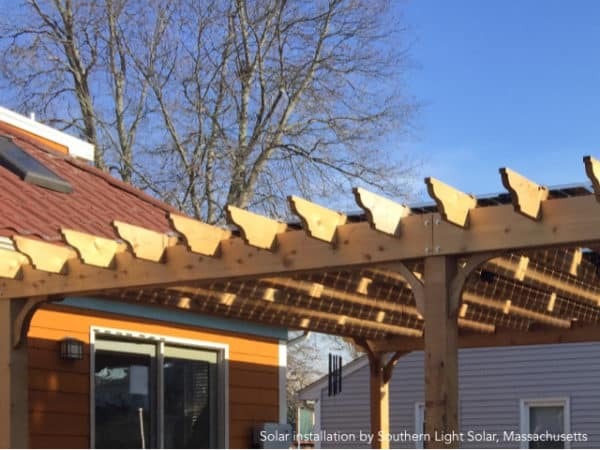 Our Big Kahuna SRP is a perfect fit for the solar contractor looking for another way to expand their solar installation offerings, or the serious DIYer prepared to configure and install their own solar pergola. 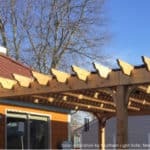 6×6 posts, Double 2×10 beams, 2×8 rafters, 2×6 angle braces, 2×2 top slats, Two 2×8 bearing boards to support a solar rack system, 2×10 ledger board + concrete anchors or lag screws (attached pergola kits only), stainless steel hardware, step-by-step installation instructions, and optional galvanized post mounting hardware. More product information is provided in the tabs below. Base price of The Big Kahuna Solar Pergola Kit standard sizes 12×12 to 20×20 starts at $3510. Smaller and larger sizes are available in standard and custom sizes. Choose your size and wood type (pressure treated pine or rough sawn western red cedar), and the additional cost for your selection will be displayed in the subtotal. Base price = $3510. Additional sizes available upon request. Standard sizes include 8×8-20×20. Custom sizes available. View pergola dimensions. 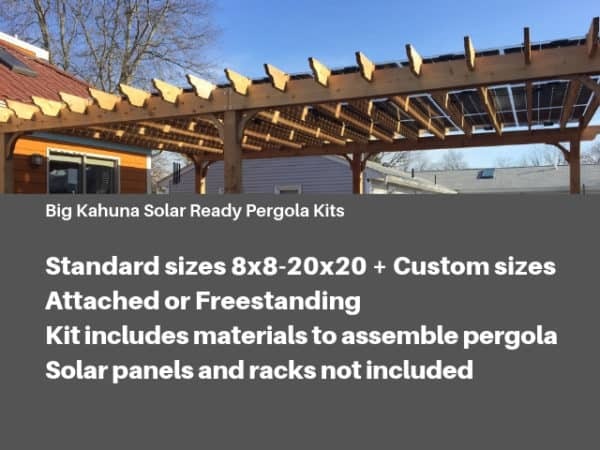 Our Big Kahuna Solar pergola kits are designed like our standard Big Kahuna pergola kits to withstand high winds and elements, but engineered to accommodate solar panel mounting. 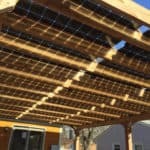 The Big Kahuna Solar Ready Pergola can be used to mount panels for a variety of solar projects. Configure your install to provide power for outdoor living environments, carport with power for charging, for backup power, or many other uses. Engineered drawings are available for freestanding or attached pergolas. Configure your solar pergola kit to be freestanding or attached to your home or other building. Offered in standard sizes ranging from 8×8 up to 20×20. Custom sizes available upon request. Like all of our pergola kits, all lumber is pre-cut, pre-drilled and marked for easy assembly. Follow the step-by-step instructions for DIY installation. 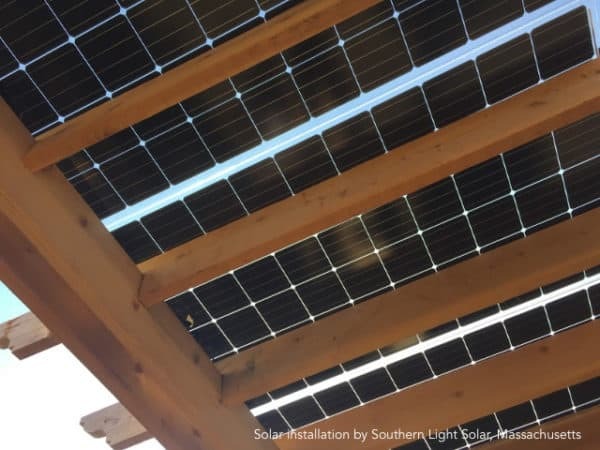 This kit includes all materials required to assemble your solar pergola, but does not include solar panels, racks, or other solar related equipment. 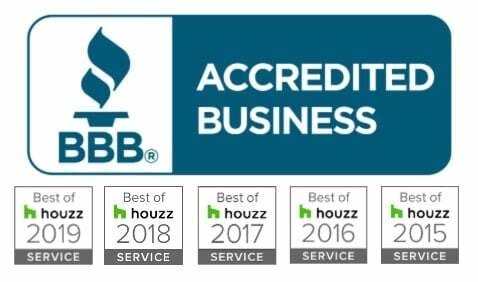 There is additional post tie-down hardware required that is not supplied with your kit because the tie-down requirements will vary depending upon local codes. If you purchase post mounting hardware, your kit will come with one base for each post, plus galvanized nails for fastening the bases to the posts; and pressure treated pine kits will also contain one Tapcon screw for each post. The engineered drawing you’ll receive with your kit will provide information about foundation requirements and post base attachment. 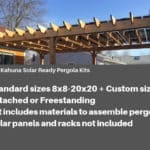 Post to Post dimensions for the Big Kahuna Solar Ready Pergola Kits are the same as our Big Kahuna Pergola Kits. View dimensions here for all standard size freestanding and attached.